I thought I’d missed the rhubarb season this year. Spring was late and then went by really quickly, taking with it a blast of seasonal produce. Fortunately, rhubarb seems to have stuck around for the time being, which is great as it’s one of my favourite fruits. I say fruit, but if you haven’t cooked with it before one thing to mention about rhubarb is that it’s not at all sweet. This is one reason I like to pair it with other, sweeter fruits like apples or strawberries. 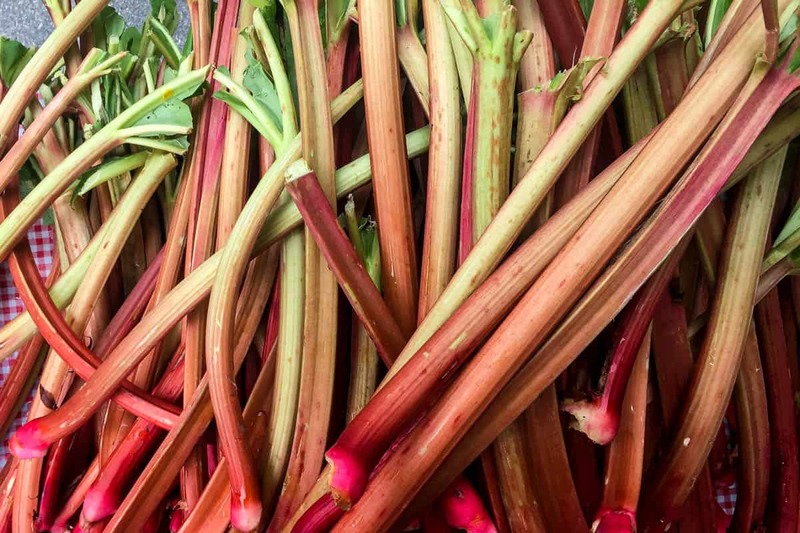 Rhubarb has a very distinctive (and delicious) sharp, almost tangy taste but be warned: if using it alone make sure you sweeten it (I like maple syrup or coconut nectar). Moving on to the recipe, I grew up in an English household where crumbles made with apples from our tree were the usual homemade dessert. Rhubarb would sometimes get thrown into the mix too. I enjoyed them, but thought they were nothing exciting as I was used to eating them all the time. It’s only now as an adult that I’ve really started to fully appreciate and miss the foods I ate growing up. Adapting my mum’s original crumble recipe to one that incorporates the way I eat these days (wholefood and vegan, without gluten or refined sugar) has been a surprisingly easy and enjoyable task. Crumbles lend themselves very naturally to a wholefood lifestyle, and are extremely simple and satisfying to make (and eat!). 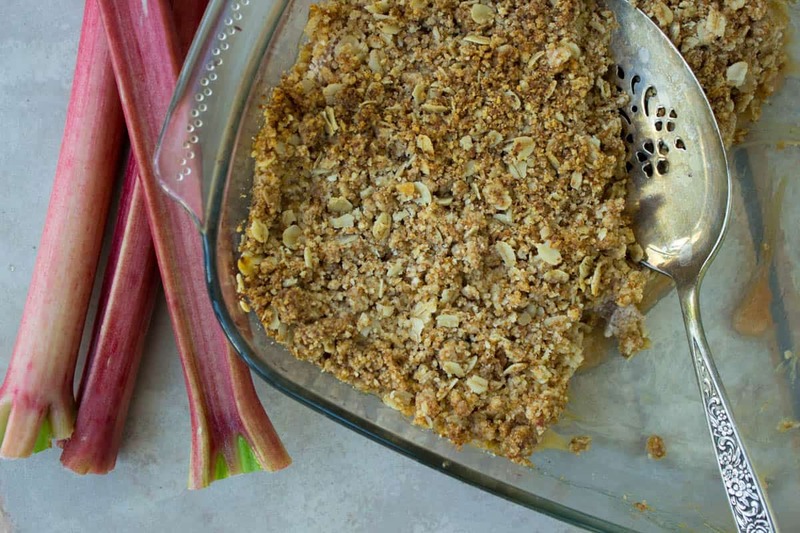 This Rhubarb and Apple Crumble recipe pairs delicious seasonal fruits – which compliment each other perfectly – with almonds and oats, to create a deliciously comforting, yet nutritious dessert. Note: If you’d prefer not to use oats, simply substitute them for ½ cup brown rice flour instead. 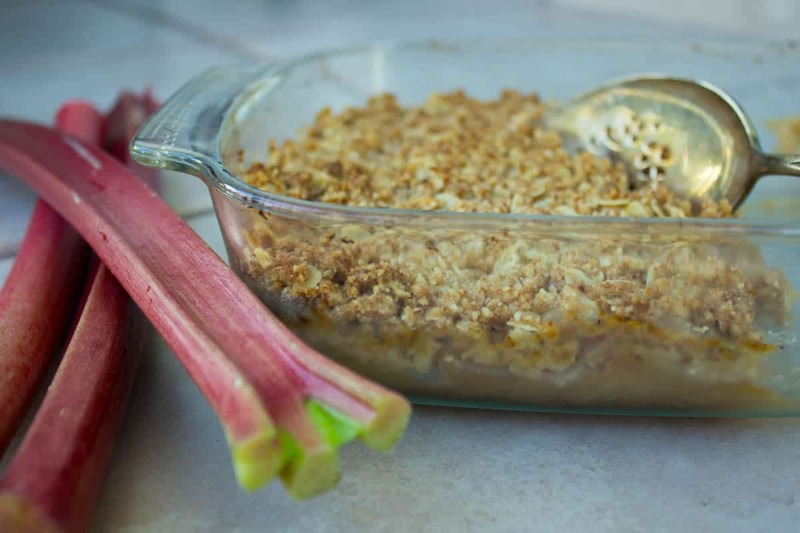 Gently heat the rhubarb and apples on a medium-low heat in a saucepan, adding 1-2 tbsp water and stirring frequently until the mixture begins to bubble. Continue to cook until the fruits have softened and disintegrate when touched with a spoon (about 15-20 minutes). Remove from the heat and stir in maple syrup or coconut nectar. Mix the ground almonds, oats, coconut sugar and cinnamon in a large bowl until all ingredients are combined. Rub the coconut oil into the mixture with your hands until it resembles a breadcrumb-like texture. Spoon the fruit mixture into an oven-proof baking dish, and sprinkle the crumble mixture on top. Bake at 150°C/300°F for 20 minutes, until the top is lightly browned and the fruit bubbling. Serve immediately with ice cream. Enjoy!